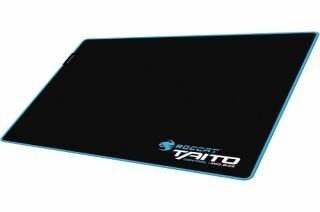 Roccat Taito Control: should I buy this gaming mouse pad? If you really sit back and think about it, the best mouse pads really haven’t changed all that much in the last decade. Sure, new materials have cropped up, and some even have some slick RGB lighting, but the core concept remains the same. Get a block of low-friction fabric that’ll last a while, put a nice design on it and call it a day. While they might not be super exciting anymore, mouse pads like the Roccat Taito Control are definitely worth your attention. Because, at just $14.49 (£16.97, AU$19.95), you’re getting a fantastic, long-lasting mouse pad that will see you through all the best PC games and more. The Roccat Taito Control is definitely a pretty simple piece of kit. You’re not going to find any RGB lighting or wireless charging, but this mouse pad does what it sets out to do and does it well. Really, we couldn’t ask for more from a mouse pad that’s as affordable as the Roccat Taito Control. And, with Black Friday and Cyber Monday right around the corner, what more could you ask for? Measuring in at 15.75 x 13.78 x 0.14 inches (400 x 350 x 3.5mm), the Roccat Taito Control is the perfect size no matter what your desktop setup is like. The main body of the mouse pad is black, as you may expect, but it’s bordered by this aesthetically pleasing teal border that will really make it stick out — especially if you have other Roccat peripherals. What really sticks out to us about this mouse pad is the fact that you don’t need to worry about it sliding around all willy-nilly. It has this fantastic rubber grip on the bottom that makes it impossible to slide around your desk — unless you want to slide it. No more readjusting in the middle of an amped-up Battlefield V match. You might find yourself disappointed with the lack of flashy lighting or unique features, but the Roccat Taito control is all about awesome performance at a bargain price. Perhaps the most compelling element to the Roccat Taito Control is just how inexpensive it is. Most of the best gaming mouse pads, like the $39 (£32, AU$89) Roccat Hiro+ or the $35 (£32, AU$48) MSI Thunderstorm, make the $14.49 (£16.97, AU$19.95) Taito Control a downright bargain. You’re getting a pretty huge mouse pad for half the price of some of the competition. And, with Black Friday gaming deals underway, we’re pretty sure that this mouse pad will be even more compelling. You might even be able to pick this thing up for less than 10 bucks.